MIT researchers with DARPA funding have developed a portable device for manufacturing a range of biopharmaceuticals on demand, virtually anywhere. For medics on the battlefield and doctors in remote or developing parts of the world, getting rapid access to the drugs needed to treat patients can be challenging. That’s because biopharmaceutical drugs, which are used in a wide range of therapies including vaccines and treatments for diabetes and cancer, are currently produced in large, centralized fermentation plants. Then they must be transported to the treatment site, which can be expensive, time-consuming, and difficult to execute in areas with poor supply chains. In an open-access paper published Friday July 29 in the journal Nature Communications, the researchers demonstrate that the system can be used to produce a single dose of treatment from a compact device containing just a small droplet of cells in a liquid. The system could ultimately be carried onto the battlefield and used to produce treatments at the point of care. It could also be used to manufacture a vaccine to prevent a disease outbreak in a remote village, according to senior author Tim Lu, an associate professor of biological engineering and electrical engineering and computer science, and head of the Synthetic Biology Group at MIT’s Research Laboratory of Electronics. “Imagine you were on Mars or in a remote desert, without access to a full formulary; you could program the yeast to produce drugs on demand locally,” Lu says. The prototype system is based on a programmable strain of yeast, Pichia pastoris, which can be induced to express (generate) one of two therapeutic proteins when exposed to a particular chemical trigger. The researchers chose P. pastoris because it can grow to very high densities on simple and inexpensive carbon sources, and is able to express large amounts of protein. “We altered the yeast so it could be more easily genetically modified, and could include more than one therapeutic in its repertoire,” Lu says. In an experiment, when the researchers exposed the modified yeast to estrogen β-estradiol, the cells expressed recombinant human growth hormone (rHGH). But when they exposed the same cells to methanol, the yeast expressed the protein interferon. Put the yeast cells into the millimeter-scale table-top microbioreactor. Feed a liquid containing the desired chemical trigger (such as methanol) into the reactor to mix with the cells. Gently massage the liquid droplet to ensure its contents are fully mixed together. Pressurize the gas in the reactor. That causes oxygen to flow through a silicone rubber membrane and allows carbon dioxide to be extracted. 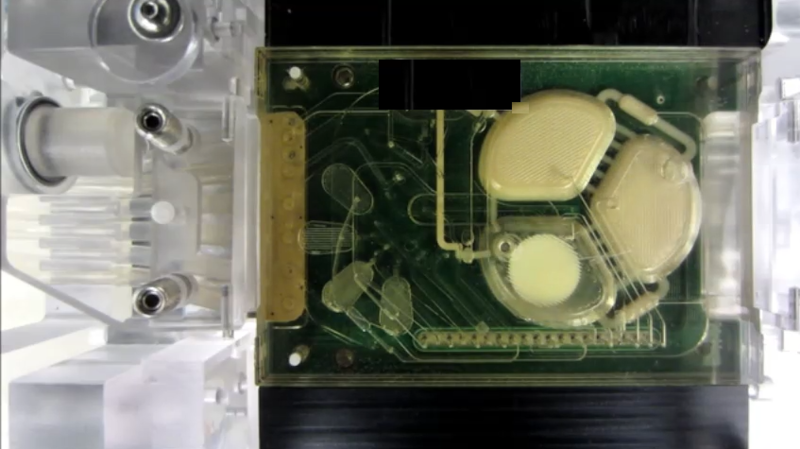 The device continuously monitors conditions within microfluidic chip, including monitors cell density, oxygen levels, temperature, and pH, to ensure the optimum environment for cell growth. If you need a different protein, just flush the liquid through a filter, leaving the cells behind*. Then add fresh liquid containing a new chemical trigger to stimulate production of the next protein. The researchers are now investigating how to use the system in combinatorial treatments, in which multiple therapeutics, such as antibodies, are used together. Combining multiple therapeutics in this way can be expensive if each requires its own production line, Lu says. “But if you could engineer a single strain, or maybe even a consortia of strains that grow together, to manufacture combinations of biologics or antibodies, that could be a very powerful way of producing these drugs at a reasonable cost,” he says. * Other research teams have previously attempted to build microbioreactors, but these could not retain the protein-producing cells while flushing out the liquid they are mixed with.